The Julie Valentine Center is a 501(c)(3) organization that provides free, confidential services to sexual assault and child abuse survivors and their families. As a community organization, we depend on the community to enable us to provide these services to our neighbors. The Julie Valentine Center depends on great volunteers. From advocating for victims to helping with simple service projects there are always opportunities to lend a helping hand. Without volunteers, our services could not exist. Last year, our volunteers spent more than 9,000 hours volunteering their time to work with our clients. 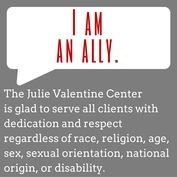 As a non-profit agency The Julie Valentine Center relies on the generosity of our community to provide the resources needed to best serve our clients. There are multiple things that the center uses daily to serve clients, as well as the occasional emergency need. By donating these items you help keep the center running smoothly. 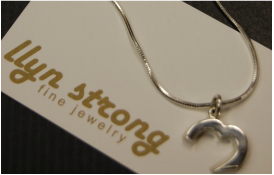 The Julie Valentine Center is honored to be featured in a custom collection by Greenville native and jewelry artist Llyn Strong. Proceeds go directly to the center.